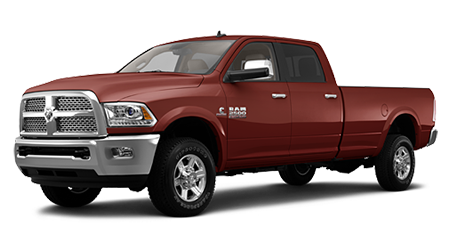 If you’re serious about torque and towing capability in your next full-size truck, check out the 2015 Ram 2500. This workhorse features the power you need with the capability and versatility to help you get any job done right. If you’re near Savannah and Baxley, GA and want to learn more about the wide range of 2015 Ram 2500 models, stop into Woody Folsom Ram in Baxley. We have a huge selection of Ram 2500 models in stock; we’ll be happy to help you find the Ram truck that’s perfect for you. The 2015 Ram 2500 comes standard with the legendary 5.7 liter HEMI V8, pumping out 383 hp and 400 lb-ft of torque –while towing up to 13,870 lbs! For even more of that HEMI power, opt for the 6.4 liter HEMI V8 which produces 410 hp and 429 lb-ft of torque, with a max towing capacity of 16,300 lbs. The larger HEMI V8 is equipped with Fuel Saver Technology that deactivates four of the cylinders during cruising for increased fuel efficiency. If that’s still not enough torque and towing capacity, the incredible power of the 6.7L Cummins® Turbo Diesel engine has got you covered! This monster of an engine features 800 lb-ft of torque and a max towing capability of nearly 18,000 lbs! A 6-speed automatic transmission is standard on every Ram 2500 model, with your choice of a 2WD or 4WD system. The 2015 Ram 2500 is one powerful and capable work truck! When you’re ready to explore the Ram 2500 further, visit Woody Folsom Ram -- we proudly serve the Pine Grove, Graham, Dublin, Savannah, Jacksonville, and Brunswick, GA areas. Our knowledgeable and dedicated sales team is here to help you find your next Ram truck!